Leaf pricing represents a premium over combustion-engine powered small sedans such as the Honda Civic and Toyota Corolla because of the cost of the Leaf's lithium-ion battery pack. YOKOHAMA, Japan (Reuters) -- Nissan Motor Co. said it would sell its battery-powered Leaf hatchback starting at 3.76 million yen ($40,640) in Japan, counting on government subsidies to slash the cost to consumers for its mass-market bet on the electric car. The price is about 1 million yen ($10,810) cheaper than Mitsubishi Motors Corp.'s i-MiEV electric car, but still well above the price of Toyota Motor Corp.'s top-selling Prius gasoline-electric hybrid. Nissan CEO Carlos Ghosn has previously said the Leaf will cost as much as a high-spec version of a diesel-powered compact car, which in Europe is about 35,000 euros ($47,200) to 40,000 euros ($54,000) depending on the brand. The Leaf will go on sale later this year in Europe and the United States. 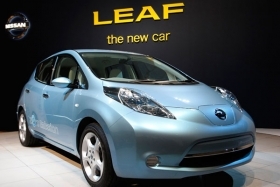 Nissan was set to announce U.S. pricing for the Leaf later on Tuesday. Analysts had expected Nissan to set the U.S. price of the Leaf somewhere between $25,000 and $30,000. A $7,500 tax credit is available for U.S. consumers who buy electric vehicles like the Leaf and the upcoming Chevrolet Volt plug-in hybrid from General Motors Co.
"The most important point of our cars is zero-emissions," Toshiyuki Shiga, chief operating officer of Nissan, said at a news conference on Tuesday. "Hybrid vehicles still consume gasoline. I want to fully push this sales point," he said. Nissan said it aims to sell 6,000 Leaf cars, its first mass-volume all-electric model, in Japan for the year ending in March 2011. The company will start taking orders for the model in April 1 in Japan, with the first delivery expected in December. After accounting for Japanese government subsidies, Nissan said the net cost to consumers to buy a new Leaf would be near 2.99 million yen ($32,373). By contrast, Toyota's Prius hybrid, now in its third generation, has a base model starting price at just over 2 million yen ($22,195) in Japan before government subsidies. The Leaf pricing also represents a premium over established, combustion-engine powered small sedans such as the Honda Civic and Toyota Corolla that analysts have said represents the cost of developing and producing the Leaf's lithium-ion battery pack. The cost of batteries and the reluctance of consumers to pay more upfront for fuel-saving technology are seen as the major hurdles to mass-market adoption of electric vehicles. Despite the initial price tag, Nissan said drivers would be able to save some money over the long run. It estimates that owners would pay 86,000 yen ($930) in electricity costs over six years, compared with 670,000 yen ($7,200) at the pump for a traditional gasoline-powered car. "If oil prices rise further, the price (of the Leaf) would become more reasonable," Shiga said. After trailing rivals Toyota and Honda in the hybrid field, Japan's No.3 automaker has bet heavily on pure electric vehicles along with partner Renault SA. Nissan has said it expects that 10 percent of the world's auto market will be electric vehicles by 2020, a ratio at the top of industry projections. The automaker has also announced a series of partnerships with utilities and government agencies in the United States and Europe where it believes it has a chance of seizing market leadership. The five-passenger Leaf is designed to provide a range of 160 km (100 miles). Nissan has developed the battery pack for the Leaf with NEC Corp. so that it can be plugged in at home and recharged overnight on a 220-volt connection. While skeptics abound, almost all major automakers are working on developing battery-run cars for use mainly in urban areas, to meet stricter emissions and mileage regulations being introduced around the world.